wanderlust ATLANTA: ...and the Argentinosaurus said, "Cheeeeeese!" 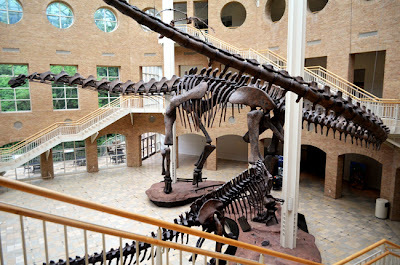 On a recent visit to the Fernbank Museum of Natural History, just as I was leaving, one of the ticket-taking volunteers—noticing that I had been making quite a few photographs—pointed out the one spot in the Museum where a standard camera lens can fit practically the entirety of the 123-feet long Argentinosaurus in the Giants of the Mesozoic exhibition...that's a LOT of dinosaur bones! And it was quite nice of the volunteer to offer his insight. That photo was the icing on the cake of a great afternoon of photo-making. So, since he was so nice to share with me, let me share with you. The spot is on the entrance level of the Museum, just past where the volunteers take you ticket upon entry. Proceed to the railing, overlooking the Great Hall, and just to the right, overlooking the first set of stairs..voila! You're now poised to make a photo that will amaze all your friends and family back home! Being a docent myself at another Atlanta attraction, I love it when people ask about the best places to make photographs. Of course the real answer is "It depends", because everyone's taste and interests are different, but at least the suggestions are a starting point. My point is to not be shy about asking Museum staff or volunteers about great photo spots...go and make some amazing photos of your vacation!